Just a couple of months before the announcement of this new novel, I was talking to someone about authors never finishing a series, like how The Host was supposed to be the first installment in a trilogy and eight years later doesn't even have one sequel. And then came the sudden announcement that Stephenie Meyer would be releasing the first in a new series--an adult thriller this time, The Chemist. Didn't we all kind of wonder what we were even supposed to think of that? I guess I read a variety of types of books--I always think that I don't, but then I look at my shelves and I compare them to other people's and I realize that I do. But there are a couple of genres that I hardly touch. Mystery, romance, and thriller. I just don't read those genres. And the only book I can think of that I've read that was probably a thriller, Blink of an Eye by Ted Dekker, held my attention while I read it but failed to keep any good opinion of mine once I'd finished it. That's how suspense usually is for me: temporary. It doesn't hold more meaning for me, and I usually prefer my books to have at least some element of lingering meaning. So I wasn't exactly excited that Stephenie Meyer was releasing a thriller. But she's one of the authors I've said I'll read anything she publishes (until I get disappointed by a book and change my mind, that is). I wasn't able to read the book right when it came out because I was reading other things first, which meant that I read it during Christmastime. And that did rather bother me at first. During this time of year, I didn't want to be spending my time reading about being on the run, people shooting at each other, and various methods of torture. Add to that that I found the first thirty or so pages exceedingly boring: they're all about spy traps and gadgets and such. I worried that all 500-some pages would be like those first pages. Then I got to the torture stuff and I wondered why I was even reading this because it just really didn't seem like my type of book. But somewhere at about that point, I started reading Stephenie Meyer again. A couple of characters reminded me of Ian and Kyle from The Host. And I saw in the elements of hiding and preparation pieces from both The Host and Twilight. Then the book started moving in toward the human element that is prevalent in all of Stephenie Meyer's work. In the midst of all of the "action stuff" (which is the easiest way of putting it without writing out the plot), the characters became people. People with personal struggles and doubts and choices and individuality. That's what allowed the plot to move forward with some interest for me, and that's what kept it from being too much of a generic action story. Okay, so I once again have a chocolate that I bought before I made my comment about what types of chocolate I want to try and stick to from now on. In fact, I'm not entirely sure why I chose this chocolate from La Cure Gourmande. It's something I haven't tried before, which is enough. But I think also that I found the packaging pretty. The card box isn't just yellow: it's a darker, richer yellow at the bottom that fades to a brighter yellow at the top, and a white lace pattern starts at the bottom and also lightens as it reaches the top. The painted picture in the middle is a late Victorian scene, and the Victorian era is my favored historical setting. And since I'm not really reviewing Christmas chocolates this year, I suppose the frilliness of this packaging acted as a stand in for all the holiday glitz. I was unprepared, however, for the beautiful way in which this yellow card box folds open. Remove the adhesive from one edge and pull to the side the back cover and you'll find a sort of envelope shape, with one edge made of gentle curves. More Victorian scenes. I hadn't been so delighted in opening up a card box in a while. The chocolate bar is equally lovely. Light and smooth milk chocolate squares, ten of them, arrange themselves horizontally rather than vertically. 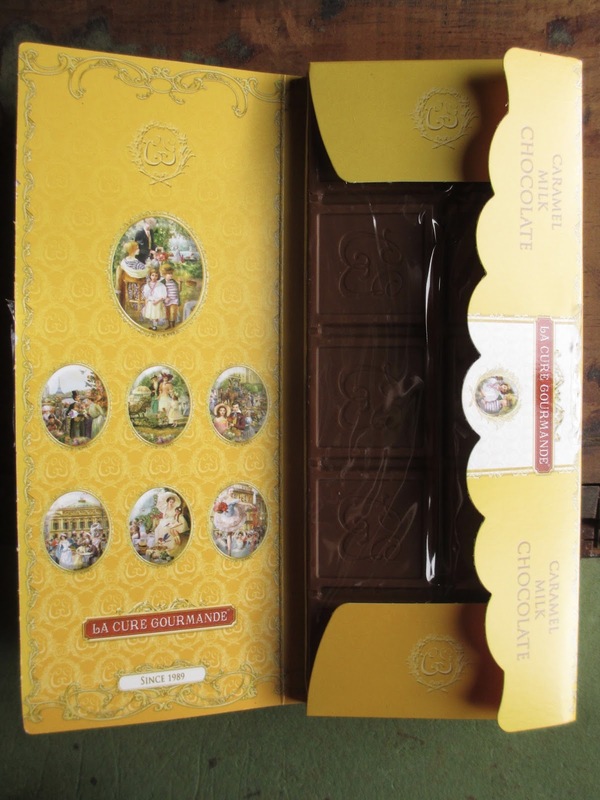 That is, you have to hold the chocolate bar horizontally for the initials "CG" (for Cure Gourmande) to become clear. Victorian-style lettering makes for a more unique look than I would have imagined, and even the simple edging on the squares is the perfect detail. As far as flavor, I feel like this chocolate tastes exactly like (or very nearly exactly like) one I've had before--but I can't seem to remember which chocolate it reminds me of. It may have been a truffle. You'll have noticed that the name of this bar is Caramel Milk Chocolate. It isn't filled with caramel, no. Rather, there is caramelized sugar in here along with the other ingredients (as well as "spices"). 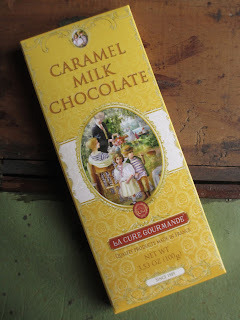 You can almost imagine that it's just a very caramel-tasting chocolate since caramel is one of the basic flavor notes of milk chocolate (this one has 31% cocoa content, by the way). But this flavor is stronger and is less linked to the flavor of the chocolate. It's like you get all the flavor of a caramel filling without the separate texture. Is it a good effect? Yes, it is. 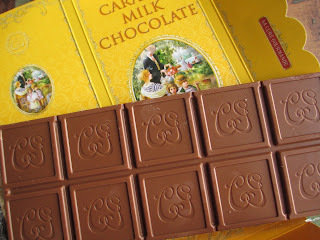 I can't deny that I'm very much enjoying this sweet caramel flavor combined with the vanilla milk chocolate. A fine milk chocolate with strong caramel notes makes for a more refined experience, that is true. This chocolate bar is more of an elevated confection, and will be a hit with milk chocolate lovers. 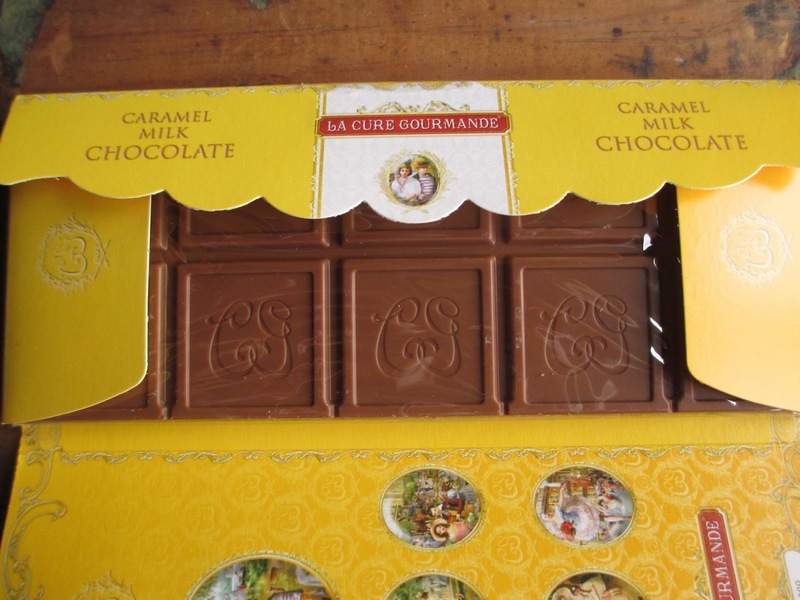 Come to think of it, it's similar to Lindt's milk chocolate--only I think it takes the flavors further (this is more of a flavored chocolate rather than a plain chocolate, after all). Given that I said this chocolate looked right for Christmas, I'm also going to add that it tastes just right for Christmas gifts or stockings. 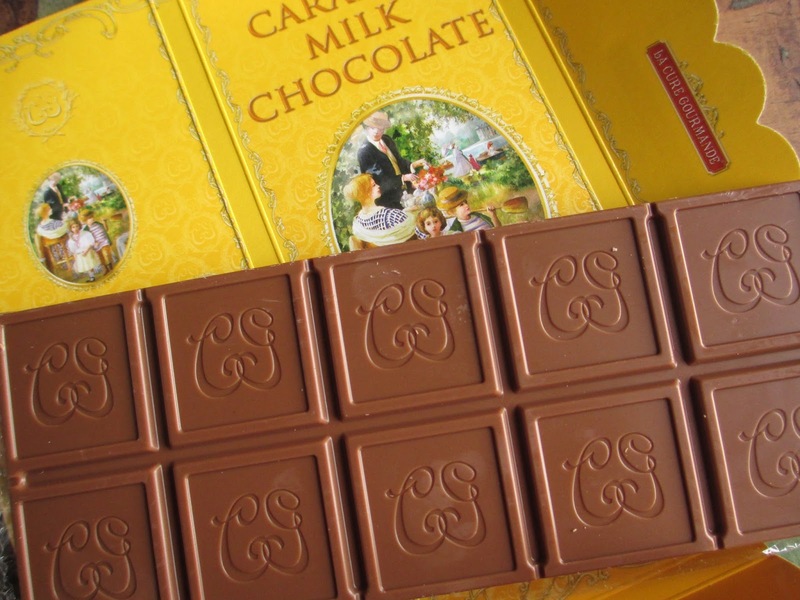 Milk chocolate works for adults and children alike. I had my plan to post a "Rogue One Expectations" today--and then I decided that I would prefer not to have any expectations for this film. So I deleted the (unwritten) post. Now I'm amending my posting decision: I'm instead simply going to talk about what I think will be different about this movie versus the others and how I'm okay with it being different. Just as watching Star Wars TV shows and reading Star Wars books prepared me for a stress-free watching of Episode VII (in which I didn't feel like I would be let down if this movie wasn't my favorite out of the seven), it's also prepared me for Rogue One. All of the other films have been part of a continuous story, and Rogue One is sort of just a side story that takes place right in the middle of it all and only has a brief, though still important, connection to the main story. So it's apart from the rest, and I expect that the movie will also feel apart from the rest, not just in its set of characters and its plot but also in its tone and its style. The question will be, in what ways is it okay for this movie to be different and how similar does it need to be to still fit into the Star Wars universe? New species of creatures can still have the Star Wars look. New locations can still feel familiar because of the buildings, tools, or technology within them. Visually, I know we'll be getting some of the material from Episode IV to get nostalgic about. I believe I heard that we're getting some new styles of cinematography, which will probably simply be an exciting new lens through which to look at this universe. I'm hoping that, even if the music is different, it won't simply sound like another movie soundtrack--especially not a modern one. Star Wars music has a specific sound that, naturally, harkens back to when the original trilogy was made, and especially given that the timeline of this film goes back to that first movie, I don't want too modern of a sound to the score. So Rogue One will be a war movie. Okay. That's fine. It is Star Wars after all. And there are battles in all the films, and wars in most of them. If there's a little more attention to the war, that's fine. What I don't want is non-stop fighting. I don't want action scenes all piled on to of one another, even if they're good action scenes (for instance, I love both The Lord of the Rings books and movies and while those films have great battle scenes, I still think that they're much too battle heavy). If we must move from one fight to another, there has to be a thread of humanity constantly in there (which, in fact, they did very well in adding in The Lord of the Rings, for instance again, despite my complaints). Humanity is the heart of Star Wars. Even if there is less of the "use the Force" and "trust the Force" thing in Rogue One, we still need that sense of finding peace within yourself and connecting to others and using that to promote your choice for good. That is, I don't think that the Force will serve the same role in this film as with the main films. But you know, was I the only one who thought that Catalyst gave hints that Jyn might end up Force-sensitive? (This would actually lend some credence to the theory that Jyn is Rey's mother.) It'll definitely be interesting to watch and see if she does, but I would also enjoy seeing how a movie plays out where none of the protagonists can use the Force. Really, I haven't said much here. I realize that. I just thought it would be nice to set down some of these thoughts before I see the movie. Probably I'll be seeing it on Saturday because that's just easier--which means I'll have to avoid certain corners of the Internet for a couple of days. My anticipation is really starting to build: I'm just immensely curious to see what Rogue One is like. Click to read Part 1 (Snow White), Part 2 (Cinderella), Part 3 (Aurora), Part 4 (Ariel), Part 5 (Belle), and Part 6 (Jasmine). Did Disney bite off more than they could chew when they chose to make an animated movie out of the legend of Pocahontas? Some say they did--but I find (after watching the movie a couple of more times) that they did about as good of a job as they could have and I'm in fact growing fond of this 1995 film (you just have to remember that the story of Pocahontas, from the beginning, was always intended as a legend rather than a history--people forget that there is little point in talking about it as a history, unless you are analyzing the history of legends). The point remains, however, that this is a difficult film for children to feel much connection toward. But let's move on with our usual analysis of Pocahontas as an animated, female character. As children, apparently my brother and I said that Pocahontas was ugly--though I have no memory of this (I would have been around four at the time). What she is is a complete departure from the previous Disney princess look, and I guess we just weren't used to seeing diversity in animation. Jasmine was supposed to add diversity--but other than her outfit, she doesn't really look too different from her predecessors. Pocahontas does, and I think the artists gave a real effort to not Europeanize her features. Her skin is a warm color, and her profile is completely different from Cinderella's or Belle's. And of course the actress, Irene Bedard, who performed her speaking voice is Native American. So I give Pocahontas full points for actually adding racial diversity to the princess group. Other than our comment about Pocahontas's looks, I'm guessing that what makes this film more inaccessible for children is the depth of its themes. There is so much material in there. Questions of two worlds colliding. Of people following or listening to others without checking to see if what they say is true. Of respect--for other people and for the world we live in. You could take this film as a message from environmentalists. I bring this up to speak to this aspect of Pocahontas's character. She is not at all like Snow White, the moral figure representing all good virtues. Yet she doesn't have the childish rebellion of Ariel, either. She is perhaps the most intelligent of all the Disney princesses, taking Belle's love of reading one step further into wisdom that has nothing to do with books. Pocahontas respects and she thinks--two highly laudable traits. When she hesitates about marrying Kocoum, for instance, she truly takes time to consider what it would mean to marry him and what it would mean to refuse him. She doesn't rashly yell out that she won't marry him, and she doesn't submissively agree without hesitation, either. What I describe could almost sound like hesitation. But Pocahontas is not the hesitating sort. She thinks before she acts, yes, but she also takes risks and tries to see the full potential of circumstances. She's an optimist. When she knows a waterfall, she will dive headfirst into the water below just for the fun of it. And so when she meets a stranger, she will think well of him until he proves otherwise--and then she will try to turn him from the wrong. Since she doesn't fear situations, you could call her brave. It's hard to find anything to pick on when it comes to Pocahontas: like Belle, she is a well-rounded character, and she is kinder and less quick to anger than Belle. Pocahontas is wise, with a sense of right and wrong, and yet she also has a sense of fun to accompany her sense of duty. A time to be serious, and a time to play. This is why the river metaphor is so strong throughout the movie: it expresses this sense of being many things at once, or many things throughout the length of life. I think Pocahontas does get the short end of the stick. With all the merch Disney sells, there is little to nothing for Pocahontas because people just don't want to buy when they can buy Snow White or Rapunzel merch instead. And people try to be smart by saying that Pocahontas is nothing like "what really happened"--even though they're missing the fact that John Smith himself intentionally wrote the story of Pocahontas the legend, not the history, and it's that legend that Disney made a movie on (if you miss John Rolfe that much, he shows up in the sequel). So we get sidetracked from what the film does offer. Pocahontas is intelligent, respectful, adventurous, and a diverse addition to the Disney princess group. I've been trying not to think too much about Rogue One because I don't to spend all that time wishing it were out already and because I simply want to enjoy it for what it is when it comes out versus forming all these expectations in my mind beforehand. Still, the release of the movie's prequel novel, Catalyst: A Rogue One Novel by James Luceno, was pretty exciting. And it's ever so much more of a catalyst for the film than the main lead-in book, Aftermath, was for The Force Awakens last year. Whereas Aftermath was setting up its own book trilogy and not necessarily setting up the movie, Catalyst really is setting up for Rogue One. It's basically all about the Death Star, and of course we all know that Rogue One will be about the team that stole the plans for the Death Star from the Empire. Mainly the book focuses on Galen Erso, who is the father of the film's main character, Jyn, and also a highly intelligent scientist. There is quite a bit of technical speak in this book, but it didn't really bore me--it somehow fascinated me instead. It isn't just science; it's also about the Force, and about where the two intersect. And in with all the technical speak and company politics (if that's the right phrase) are questions of scientific ethics and personal morals. What makes something good? And if something is better than something else, is it really bad? All very interesting to read, and all very Star Wars. From the Star Wars books I've read so far, I thought that I preferred the more dramatic books. This one seems less dramatic, and yet I really enjoyed it; it's kind of a slower read, but I didn't mind that. And I think the reason that it still appealed to me was that everything was in fact grounded in individual characters and human nature and all of that side of things. James Luceno also penned every passage so well that instead of just looking at plot, I was also noticing the way this story was written--which is a treat for what you might be able to call genre fiction. The way this book is physically composed was also, well, rather awesome. The chapters have names, which I'm not used to anymore--that helped to spur on my excitement for each next phase of the book (because, of course, we all know going in what the basic story will be, so it isn't simply a question of what will happen, as it is with other books). And in the page before each chapter starts, there is a close-up of, presumably, the Death Star plans themselves. Grey lines on a white background that at first just look like a pattern--until you realize what they are and the awareness becomes almost chilling. One more week until Rogue One, and this book has indeed whet my appetite for the film. I lived in California until I was almost eight. Then I grew up in a couple of small towns in the center of Arizona. I moved to the Phoenix area for college. And when I graduated, I couldn't get back home fast enough to the area that I said I loved so much. I said that I liked living out here, that I preferred it to living in the city. Three and a half years passed, and all of a sudden on Saturday morning I decided to move back to the city. But was it sudden or not? I've realized that the idea of moving and simply the idea of location had been brewing in my mind since summer. At this time, I did think I was going to move to a somewhat bigger town not too far away, and so I was trying to get myself used to the idea--but that move didn't work out for various reasons. I was part disappointed and part glad, and part of me didn't even know what I thought anymore, or where I wanted to be anymore. So that was when I started thinking about where people live and why they live there and how they choose where they live. We can all look at a map and point to someplace where we think it would be nice to live. But we end up living in a certain place because that's where our family is, that's where we have a job, that's where we can afford to live, or other such reasons. What makes the difference, I have come to realize, is what we do with our daily lives and how and where we choose to spend our time. If I say that I don't like cities because there's too much cement and not enough land, I can get membership at the Botanical Garden, for instance, and go there twice a week or even more if I want. I can walk around or find a place to sit and maybe read or write. I can visit trails and parks--if I don't want to stay cooped up at home, then I don't have to. And there are other things, too. If I want, I can go see every play that Southwest Shakespeare puts on each season. I can go see Ballet Arizona or Phoenix Symphony performances every once in a while and not have to drive two hours home afterward. I can go to the Art Museum more regularly. My point is, I like these things and I sometimes lament that they haven't been a greater part of my life--but I'll have the opportunity now to make them a part of my life. In some ways, I've let myself go stagnant, and now I want to get back into a rhythm. I'm taking Christmastime as a break and a chance to finish wrapping up some things over here, and then the plan is to move in January. Click to read Part 1 (Snow White), Part 2 (Cinderella), Part 3 (Aurora), Part 4 (Ariel), and Part 5 (Belle). I must admit straightaway that, while most of my generation loves 1992's Aladdin, I don't overly care for the film. I didn't really watch it when I was younger, so watching it today I'm just not convinced that it's as good as some of the other Disney offerings. But it's starting to grow on me, and I'm trying to give it a chance, so I'll try and also give Jasmine a fair assessment. The strange thing is, I was getting ready to talk about race in my next post on Pocahontas--and then I realized that Jasmine perhaps isn't exactly white, either. (I don't know, anyways, what white is--but she's not white or European like the previous five princesses). But I followed my realization by thinking that Jasmine almost might as well be European. I won't get into that any further, except to say that, in terms of race or whatever you'd like to call it, Jasmine doesn't offer as much as she could have to the Disney princess group--except that perhaps girls with darker skin tones might feel like they look more like Jasmine than like Snow White or the rest up to this point (even though Jasmine is still pretty light, she is less "white"). So what does Jasmine offer? Still, we must admire Jasmine for being able to speak her own mind and stick up for herself. She is also daring when she leaves the palace on her own, even if she's a little ignorant in the marketplace. Her attempts to give food to a hungry child, however, show her inherent kindness--and her ignorance is simply meant to be a sign of how tightly she has been locked up in the palace. Jasmine is very much a victim of circumstance--and I'm not sure if I am neutral toward this plot point or if I dislike it. Jasmine seems as if she needs Aladdin to rescue her even more than Aurora needed Philip: without Philip, Aurora would've just slept on in oblivion, but without Aladdin, Jasmine would have continued to live a shackled life. Out of all the princesses, Jasmine lives in the most constrained world: it is not just individual events that hold her down, it is the entire system. It is, though, more Jasmine's environment that I am criticizing. Jasmine herself is alright. There is some attempt at making her smart, and she is kind in a natural way rather than a contrived way. And if she were a Victorian heroine, she would be very praise-worthy. I just wish that she didn't have to waste her time rebelling against a system that didn't need to be part of her plot to begin with (as fantasy stories, these films have the freedom to pick and choose whatever historical details they do or don't want). 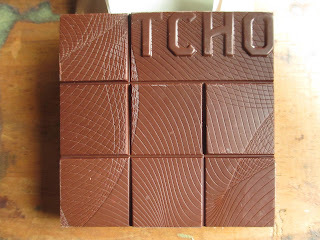 For some reason I can't quite explain, I find that I have been avoiding TCHO Chocolate. It has been so long since I've had any of their products that I can't even remember which ones I have tried. Wondering if perhaps I hadn't favored their plain chocolate (although this is simply a guess because I have no memory anymore of what TCHO's chocolate tasted like), I decided to experiment by getting a flavored chocolate instead of a plain one. After all, every company has its strengths, and some are better at either plain or flavored chocolate. 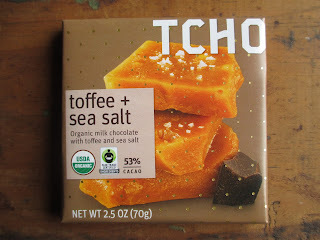 So let's start afresh with TCHO with their Toffee + Sea Salt bar. I am growing increasingly aware that I need to be buying organic and fair trade (not "Fair Trade," just something with that concept--certain of the gourmet chocolatiers, for instance, don't necessarily work within the Fair Trade system but they do work with the cocoa farmers all the same) products. Coffee, tea, and chocolate are three products that stand out. I used to say that I would mainly buy fair trade chocolate except when I wanted to try a new product so I could review it. I'm still going to do it; I can't say that I won't because I know that isn't true. But I am growing increasingly guilty about buying mass-produced chocolate that I know isn't made with what we would call ethical cocoa. You vote with your dollar and you help change the world with those votes, after all. So. You might see something of a change in the type of chocolate I'm willing to review now. I take the time to say all of this at this moment because I see that TCHO is in fact organic and fair trade--they're also a bean to bar U.S. company, which is nice. So I should in fact be paying more attention to TCHO (World Market keeps a nice supply of their bars right now). The chocolate in this bar comes in at 53% cocoa, but it's labeled here as milk chocolate--which I appreciate. I rather dislike sweet chocolate being passed off as dark chocolate, and milk chocolate being something ridiculously watered down. The paper wrapper is casual in its style, though also modern and trendy with a enough of a touch of elegance to hint at quality. It has been so long since I've seen a TCHO chocolate that I'm taken anew with the design of the bar. That geometric pattern has so many lines and so many details; even the small squares are set at angles rather than keeping the usual flat, level surface. This look is what I've been calling quality that's approachable. Once you break a piece of the chocolate, you can see the small toffee crystals; they're mostly clear but with a slight shade of yellow. Now, I am fond of toffee, but these small pieces are still a nice change from the big, thick toffee that gets stuck in your teeth. The first taste I had was of the sea salt, which is crisp and sharp in flavor. The chocolate comes in next, followed soon by the sweet and salty toffee. Each element has its moment, and each moment blends well with the others. I was slightly worried about the cocoa content of the chocolate: sometimes chocolate in the 50's range is bland and stuck in the middle of two concepts, sweet and dark. This chocolate is neither exactly sweet nor dark and yet it isn't bland: it's more solid in flavor than anything else, and its taste does have warmth. It makes for just the right companion to the toffee and salt. It's quite a good bar of chocolate. And the more casual nature of the toffee means that you can use this one as a replacement for chocolate candy bars. Sure, it costs more than a candy bar, but there are nine squares (or three rows) in one of these bars, so it in fact works out to be a good value. Now that December is upon us, this would be a great addition to Christmas stockings, too.